For all of you following me over on my Instagram, y’all already know what this awesome possum post is gonna be about. This girl finally got her hold on the second book in the HP series, and finished it yesterday night! I am loving this series more and more as I read it for the first time ever, and am regretting that this is my first exposure to the wonderful world of Hogwarts. Nonetheless, since just about all of Bookstagram and all the book bloggers have been exposed to HP reviews and rants and raves, etc., I will once again stay away from rating/reviewing the book, and just talk about some ideas/questions that popped up while I was reading. I would love to hear your answers! 1. If you were sent a Howler while at Hogwarts from your parents/relatives/etc., what would it be for (can include magical and muggle misdeeds)? Mine would definitely be for leaving my wand, books, and broom at home. Back when I was in school my mom always told me I’d leave my head behind if it wasn’t attached to my body, so it would make sense that I would do that regardless of the fact that I was going to Hogwarts. I’m like basically a clumsy, forgetful (of my items) version of Hermoine. 2. If you had a house elf what would you name him? Would you free him? I think I would name my house elf Bumbledore (I’m imagining a bumbly, chubby house elf) or Snitch if he was small and fast. Also keep in mind that I am only two books in and have not seen the movies so I may not know of cooler names (or I’m just not creative). Also, I would like to think that even after I freed him, I would be such a great homeowner that the elf would stay and live with me – but I would absolutely free him. 3. If you could speak to animals like Harry speaks to snakes, which animal would it be? (Also not sure if this is addressed in later books but…) I would want to talk to unicorns. They’re such cool creatures in this book, and in other books and I feel like if you can talk to unicorns then you can talk to horses and zebras and Pegasi. Unless unicorns speak a different language, in which case my point still stands because they’re super duper cool. Also, this is just more of a question that I am sure will be answered in later books (no spoilers please) but what the actual heck is up with Draco. Like he is such a brat! I honestly can’t wait for him to be humiliated. I also really want his dad to lose all his money and Draco to finally have a smaller ego. I literally can not stand him right now. Anyways, you guys should all answer the questions above, and I’d love to chat about your thoughts on them. Talk to you soon!!! I need to reread as I don’t remember enough to answer these questions! 🙈 Don’t worry I just bought a new set of books and will be reading soon! 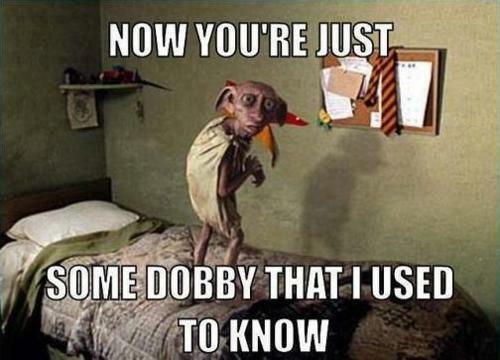 Dobby is pretty great, isn’t he?! And yes, Aragog was super cool – it’s a bummer he was okay with letting his family eat Harry though lol. I would get a howler for losing things. My house elf would be Tina and a free one that would love to sing. I would want to talk to horses!